I’ve been collecting Christmas gifts for Ebony and Ember for a few months now. In fact, I think I’ve got pretty much everything I need this year. We don’t go crazy for Christmas. I think there’s a tendency to overspend on things just for the sake of it in modern society. Whilst teenagers may want the latest electronics, younger kids are just as happy with cheaper toys so it seems unnecessary to spend more. I’ve chosen things I know Ebony will love rather than things that cost a lot. 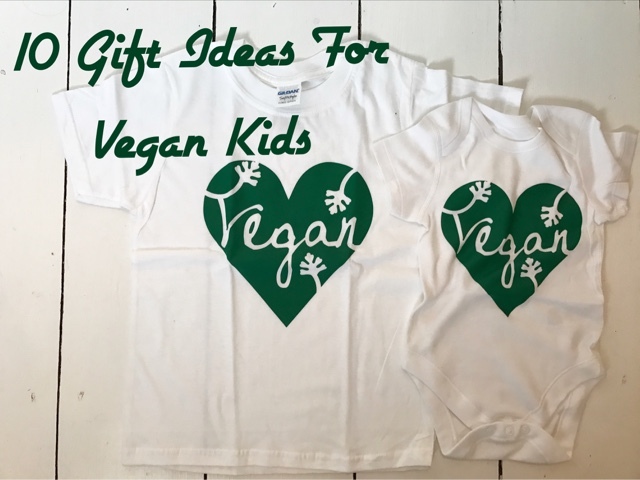 A couple of the things I got for Ebony are vegan-focused so I thought I’d write a post of gift ideas for vegan kids. Ember hasn’t got much for Christmas, just a few little bits to keep the illusion of santa alive for her older sister who would otherwise question why Father Christmas hadn’t bothered bringing toys for the the baby. I cannot express in words how great this book is. I actually took photos for a review when I was pregnant but never got round to writing it up because babies. Ebony loves cooking and this is a completely vegan cookbook aimed at kids. She loved picking out a recipe and then making it together. And the recipe she chose was full of healthy ingredients which was pretty pleasing. This book is definitely the perfect gift for the little vegans in your life. You can order it from Amazon for £13.48. Ebony has a Sea Shepherd t-shirt I bought her earlier in the year and she loves it. She’s always really proud when she wears it and she makes me read the writing to her over and over again. I ordered this vegan baby vest for Ember this Christmas after seeing it in a vegan parenting group on facebook. I absolutely love the green leafy design. I contacted the company who make them and they made me a matching t-shirt for Ebony too, I cannot wait to see Ebony’s face when she finds out they have matching clothes, she is a great believer in the ‘twinning is winning’ philosophy. There are a number of vegan sanctuaries in the UK who you can support. I think giving kids charity gifts is a great way to encourage compassion. Kids end up with so much plastic crap at Christmas, a heartfelt charity gift is different and can be extra special. Hillside Animal Sanctuary in Norfolk is a reputable vegan sanctuary and they offer adoption memberships for a number of animals. You could adopt an animal for s little as £13, you can see a full list of the animals available for adoption here. You’ll receive a presentation bag with info about the animal and updates throughout the year. My four year old loves a good tattoo. Temporary tattoos are always a big hit so I was really excited to find this set of vegan temporary tattoos. There are two different designs, I went for the sheet of tattoos without swear words (Ebony thinks blah blah blah is a ‘spare word’ at the moment and I’m happy to keep it that way for now). A sheet of vegan temporary tattoos costs £5 and you can order one from Things I Care About. I think these are the perfect stocking fillers for vegan kids this Christmas. I bought this book for Ebony when she was a lot younger. It’s a simple rhyming book in an abc format that focuses on veganism and I absolutely love it. It’s sweet and simple and positive, which is exactly what vegan children should be. Ruby Roth has a few other books which are also great but most of them seem to be for slightly older children so V is for Vegan is a firm favourite in this house. You can order it from Amazon for £10.26. Vegan wagon wheels. Game changer. I love vegan wagon wheels. I attend every vegan fair in a 20 mile radius just so I can buy vegan wagon wheels. I’m obsessed. They are so good. Every child needs one, especially at Christmas. They’re made by Ananada Foods and they’re just so tasty. Can you tell I like them? Anyway, they’ve released special Christmas ones this year which you can order from Amazon for £3.20. I will be finding one in my stocking this year, I’ve already had a word with Father Christmas. Going back to my love of charity gifts, I saw vegan parents discussing their favourite youth memberships and the consensus seemed to be that the RSPB kids membership was best. It’s apparently great at encouraging kids to engage with and enjoy nature. It sounds amazing and I wish I’d found out about it before I finished my Christmas shopping (and spent all my budget) for this year. It’s definitely going on the Christmas gift for less year. Members get free entry at nature reserves across the country which is something Ebony would love too. It’s just £21 a year for one child or £32 for multiple children and, of course, your money goes to an important cause. You can order a youth membership here. Ebony loves bath bombs so for Christmas this year I bought her a set of vegan bath bombs from Superdrug. In fact, if you’re looking for anything pamper or beauty related, Superdrug is the place to go because they label their products as vegan. Lush is another great place to check out if you’re looking for bath bombs and other luxury pamper treats. Also, check out Soapy Solidarity who make vegan soaps to raise money for an animal charity based in Palestine. Ebony treasures her cards as much as she treasures her presents, she has a stash of cards she’s apparently going to keep until she dies. I love these vegan-themed Christmas cards by ForVegans, especially the unicorn one. I cannot express how much Ebony would love the unicorn one, I think the concept of a vegan unicorn would blow her sweet little mind. You can order a set of 6 vegan Christmas cards from ForVegans for £10.99 here. It wouldn’t be Christmas without chocolate coins, would it? After years of hoping and wishing and waiting, there is finally something that sort of resembles chocolate coins. They’re not actually coins and they’re not in the gold foil wrappers I remember from my youth, but they’re disc-shaped and wrapped in foil and that’ll do me. I think a few of the supermarkets are selling this year, but I got mine from Tesco. I bought a bag to put in Ebony’s stocking along with a satsuma. I’ve also bought her a chocolate orange bar from ASDA because they taste like Terry’s chocolate orange and I always used to find one of those in my stocking when I was a kid.